I know I said I didn't give myself a goal for this marathon.... but curiosity got the best of me and I went back to count where I am on my marathon. As of right now I have watched 26 movies and 10 TV episodes. Not bad... but far, Far... FAR from my best! Brace yourself for a fearsome fright fest...times four! Maestro of Mayhem Vincent Price narrates this quivering quartet of Edgar Allan Poe's most spine-tingling classics, including: "The Tell Tale Heart," "The Sphinx," "The Cask of Amontillado," and "The Pit and the Pendulum." Dripping with gruesome torture, live burials, monsters, madness and murder most foul, An Evening of Edgar Allan Poe will chill you to your very marrow! This short anthology film is a treat for fans of Vincent Price. He is the sole actor here, doing four of Poe's short stories as, basically, one-man stage shows. It's very much a showcase of Price's talent, since each story allows him to develop a different character. "The Tell-Tale Heart" and "A Cask of Amontillado" are both two of Poe's best known stories and the best of these four features. One showcases Price as a raving madman, the other as cold and calculating a villain as you'll ever see. "The Pit and the Pendulum" is good, but I don't find it as engaging as the other two, though Price plays desperate terror quite well. I find "The Sphinx" the weakest of the lot, though still enjoyable. 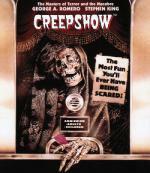 This was made for television, and obviously very cheaply, but if you're a fan of Vincent Price it's well worth seeing. 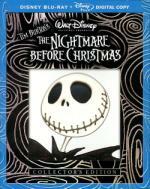 This is one of my favorite anthology movies. Sure... some of it is right silly but... even so for the most part all the segments are just fun to watch. I think my favorite segment was the one where "A scheming husband plants two lovers up to their necks in terror."... this was the one where Leslie Neilson buried the couple to their necks in the sand on the beach... waiting for the high tide to come. That one then followed closely by the "crated creature" Fluffy. My least favorite has to be the last segment... the one about the bugs. I mean it was ok... just nothing special. But of course I enjoyed all the segments. Normally it is the wrap around story that loses my attention. But this is one of the few that I actually enjoy. Though I must say... I am disappointed in the extras on the blu-ray... nothing other then the Theatrical Trailer. How many people can say that satisfying their munchies helps solve murders? Meet Olivia "Liv" Moore, a medical resident on the fast track to a perfect life...until she's turned into a zombie. Now stuck between half-alive and undead. Live withdraws from her best friend, calls off her engagement and transfers to Seattle's morgue to access the only thing that allows her to maintain her humanity – human brains. But there are side effects to Live's new diet. She gets visions – flashes of the corpse's memories – including clues as to how they were killed. Liv's boss, a brilliant medical examiner, encourages her to embrace this newfound talent and help an eager, unproven homicide detective solve the murders. It's the least a good citizen zombie can do! From the brains behind Veronica Mars and based upon the comic from DC Entertainment's Vertigo imprint, iZombie delivers crime-fighting zombie adventures in all 13-Season One episodes. I have now watched the entire season of this show on Netflix. When I first read the plot for this series I was curious but to be honest didn't expect to much of anything from it. As it turns out... I found I enjoyed it very much. They do not take theirselves to seriously and just has fun with it. It didn't take long at all for me to like the characters and get into the storyline. I hope to add this series to my collection before too long. For Richard Dees (Miguel Ferrer) facts are always stranger than fiction. Every headline is a dead-line. Serial Killers, UFO abductions, tales of molestation, mayhem and murder. To some the tales are unbelievable -- but his faithful readers believe. And now there's a new story. 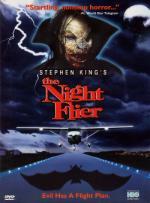 The Night Flier. What is it that flies by night in a dark-winged Cessna, lands at secluded airports and brutally murders local residents? Dees begins to follow the unknown killer in a Cessna of his own, uncovering clues that reveal a pilot more terrifying than he could ever have imagined. A creature so untamed by human nature, that their final confrontation will leave no body unbloodied. Stephen King's take on a vampire legend. Being a vampire movie alone gives it a good chance I will enjoy it... and I definitely did. 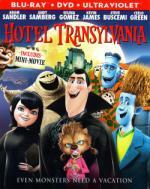 But it is definitely not the best vampire movie I ever seen. Like It did seem a bit weird... the idea of a vampire flying around in an airplane everywhere he goes. There was a couple things did I liked about this movie though... they way they made Dwight Renfield (the vampire) look... as well as the effect the vampire's blood had when he effected Richard Dees with it. I really liked the use of Black and White in that scene. It really enhanced the spookiness of the scene. I've reviewed this before: read here. Still a fun film. This is a competent enough film, but suffers from being thoroughly predictable. After their car crashes, four teens are forced to spend time by the side of the road telling stories, all of which are well-known urban legends. "The Hook" is the most well-known, and a throwaway bonus tale. Nothing special here. "The Honeymoon" does well to leave you never actually seeing the creatures, and therefore letting the imagination run wild, and I liked that the girl fought back instead of just screaming and cowering. "People Can Lick Too" does well with creating tension but the villain doesn't act as someone like him would. It almost seems the filmmakers are afraid to go where the story should take them. I thought this was the weakest of the group. "The Locket" was my favorite. I liked the production design and atmosphere here, even if I knew how it would end. The wraparound story wasn't bad either, but you could easily see where it was headed. Twist ending aren't as fresh now as they might have been when this was released. This is a low budget film, and there's some pretty clear technical errors (most glaringly to me, the red camera sights that were visible multiple times). The acting was competent, but nothing spectacular, though I did like how expressive Jacinda Barrett was in "The Locket," especially given I think she was cast because she was very pretty. Recommended if you like anthology horror, but don't expect any surprises. This is a wonderful gothic romance in a very old-school Hammer Films kind of way, with its horror flavored in Poe and Lovecraft. It's a visually gorgeous film, with fabulous production design, Victorian styling, and a luscious use of color. The reds are very rich, the blacks deep, the whites bright, the contrast high. One might call the color almost oversaturated, as rich as it is. If they recognize nothing else, the Academy ought to nominate for costume design. I know they have a history of disdain for genre films, but at least the costumes ought to get a nod. I enjoyed the story, but it is pretty typical tragic gothic romance, so if you know the tropes you won't be surprised. I still liked the story, and I thought the creepy atmosphere the film developed was great. Aside from the beautiful quality of the entire film, the other thing saving it is the superb performances. 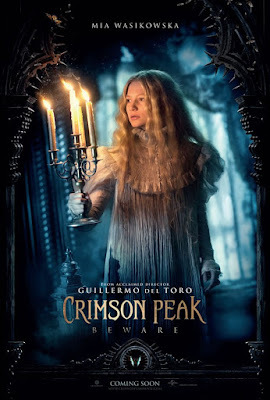 Del Toro really brought forth great characters for these actors to work with, and they don't disappoint. Especially Tom Hiddleston and Jessica Chastain, who really carry the film. Mia Wasikowska does well with her part, but she doesn't have the meat the other two do, and therefore doesn't stand out like they do. I'd recommend this if you like Del Toro's oeuvre, or you enjoy Poe, Lovecraft, Anne Rice, or Hammer Films. Don't go into this thinking it's a straight horror film, or traditional haunted house film - it's definitely not and if that's what you're looking for, you're going to be disappointed. I loved this film. I think it might be my favorite of everything I've watched this month. I've reviewed this film before: read here. A classic of the season. Lucio Fulci's masterpiece of face-chewing spider action, milky-eyed psychics, face-melting embalming fluid and rotted flesh-crazed zombies returns in all its blood-splattered, surreal and grossly disturbing glory for a new generation of horror kids! The Beyond is Fulci's Zombie masterwork as he assaults his audience with shock after head-spinning shock, all the while leading up to one of horror cinemas most heart-stopping finales. The Beyond drives sane men mad and leads others to murder. Dare you step over to the other side? This was a really bizarre movie. The plot was super thin, and too much was never fully explained. I can make some inferences, and that might be what Fulci was wanting the viewer to do, but I would have liked more meat in the story. There was certainly time for it; the death scenes were drug out for the sake of the gore effects, especially the one where the spiders eat the guy's face. I had read this film was gory, and that's definitely true. I'm not necessarily against gore, but there was no need to linger on it the way this film does. The characters also really annoyed me. Eliza is another cowering, screaming, useless female character. Then there's John, who is a doctor and therefore supposedly smart, yet can't seem to grasp that shooting the zombie in the head kills it and nothing else does. At the same time, there are some gorgeously artistic shots in the film, especially the ending sequence, that are almost worth sitting through this film again. Almost. I suppose this isn't a film for me, and I doubt I'll watch any of Fulci's other films. I don't mind surrealism, or a sparse plot, but I do mind when things are just dropped in and then never followed up on. Especially when there was lots and lots of time for lingering over the blood, wounds, and eye-gouging. I don't know who to recommend this to, but apparently it's considered a classic and lots of people do like it, so your millage might vary.